It is also known as TriCarboxylic Acid (TCA) cycle. In prokaryotic cells, the citric acid cycle occurs in the cytoplasm; in eukaryotic cells, the citric acid cycle takes place in the matrix of the mitochondria. The cycle was first elucidated by scientist “Sir Hans Adolf Krebs” (1900 to 1981). He shared the Nobel Prize for physiology and Medicine in 1953 with Fritz Albert Lipmann, the father of ATP cycle. The process oxidises glucose derivatives, fatty acids and amino acids to carbon dioxide (CO2) through a series of enzyme controlled steps. The purpose of the Krebs Cycle is to collect (eight) high-energy electrons from these fuels by oxidising them, which are transported by activated carriers NADH and FADH2 to the electron transport chain. The Krebs Cycle is also the source for the precursors of many other molecules, and is therefore an amphibolic pathway (meaning it is both anabolic and catabolic). The first reaction of the cycle is the condensation of acetyl-CoA with oxaloacetate to form citrate, catalyzed by citrate synthase. 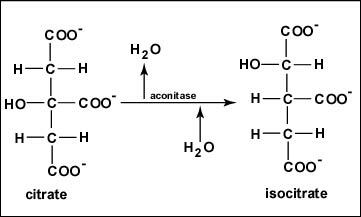 Once oxaloacetate is joined with acetyl-CoA, a water molecule attacks the acetyl leading to the release of coenzyme A from the complex. The citrate is rearranged to form an isomeric form, isocitrate by an enzyme acontinase. In this step, isocitrate dehydrogenase catalyzes oxidative decarboxylation of isocitrate to form α-ketoglutarate. In the reaction, generation of NADH from NAD is seen. 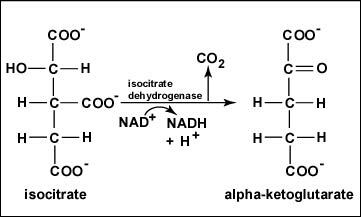 The enzyme isocitrate dehydrogenase catalyzes the oxidation of the –OH group at the 4′ position of isocitrate to yield an intermediate which then has a carbon dioxide molecule removed from it to yield alpha-ketoglutarate. 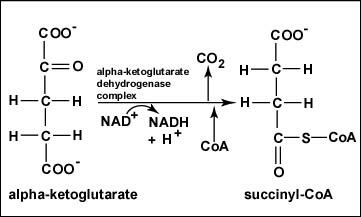 Alpha-ketoglutarate is oxidized, carbon dioxide is removed, and coenzyme A is added to form the 4-carbon compound succinyl-CoA. 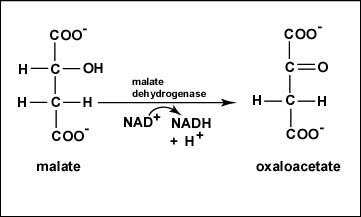 During this oxidation, NAD+ is reduced to NADH + H+. The enzyme that catalyzes this reaction is alpha-ketoglutarate dehydrogenase. 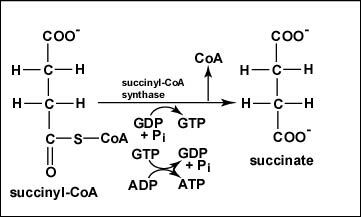 CoA is removed from succinyl-CoA to produce succinate. The energy released is used to make guanosine triphosphate (GTP) from guanosine diphosphate (GDP) and Pi by substrate-level phosphorylation. GTP can then be used to make ATP. 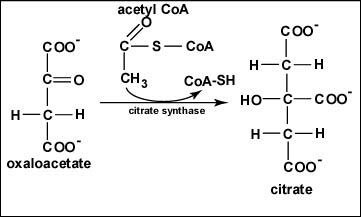 The enzyme succinyl-CoA synthase catalyzes this reaction of the citric acid cycle. Succinate is oxidized to fumarate. During this oxidation, FAD is reduced to FADH2. 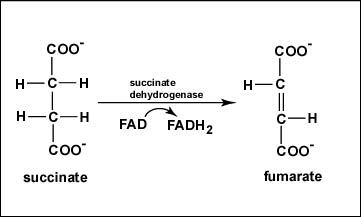 The enzyme succinate dehydrogenase catalyzes the removal of two hydrogens from succinate. The reversible hydration of fumarate to L-malate is catalyzed by fumarase (fumarate hydratase). 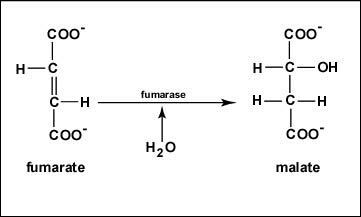 Fumarase continues the rearrangement process by adding Hydrogen and Oxygen back into the substrate that had been previously removed. Reviewing the whole process, the Krebs cycle primarily transforms the acetyl group and water, into carbon dioxide and energized forms of the other reactants. Intermediate compounds formed during Krebs cycle are used for the synthesis of biomolecules like amino acids, nucleotides, chlorophyll, cytochromes and fats etc. Intermediate like succinyl CoA takes part in the formation of chlorophyll. Amino Acids are formed from α- Ketoglutaric acid, pyruvic acids and oxaloacetic acid. 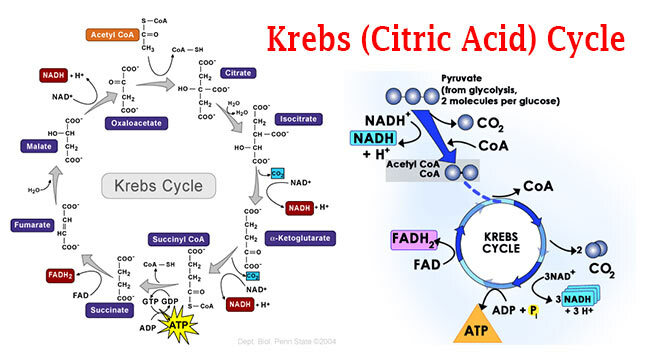 Krebs cycle (citric Acid cycle) releases plenty of energy (ATP) required for various metabolic activities of cell. By this cycle, carbon skeleton are got, which are used in process of growth and for maintaining the cells. Lehninger Principles of Biochemistry. 5th Edition. Chapter 15 : The Citric Acid Cycle. Clackamas Community College. Citric Acid Cycle. Gary E. Kaiser. Community College of Baltimore County. The Citric (Krebs) Acid Cycle. University of Michigan. Krebs Cycle. Newcastle University – Teaching Server. School of Biomedical Sciences Wiki. Krebs cycle. Spark Notes. The Citric Acid Cycle. John M. WyzAnt, Inc. The Krebs Cycle. University of California, Davis. Chem Wiki. Kreb’s Cycle. Boundless Biology. Citric Acid Cycle. Khan Academy. Krebs / citric acid cycle. Tutor Vista. Biology. Citric Acid Cycle. Study.com. The Citric Acid (Krebs) Cycle: Products and Steps. Plz! Explain me relationship between catabolism&anabolism? Why does this system do this how is it initiated?